Nintendo UK have released a trailer in aid of promoting the recently announced Yoshi Chase. 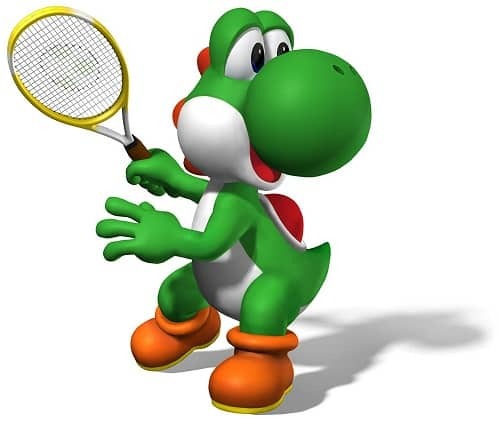 This sees Nintendo 3DS owners track down QR codes that will enable them to unlock different-coloured Yoshis, each with their own strengths, that may be used within Mario Tennis Open. These will be distributed through various means, with the first, a Black Yoshi, available across 30 Asda stores between Friday 25th – Saturday 26th May 9.30am – 5.30pm. Participating stores include: Minworth Supercentre, Tamworth Supercentre, Patchway Supercentre, Cardiff Supercentre, Queensferry Supercentre, Ellesmere Port Supercentre, Coventry Supercentre, Derby Supercentre, Hessle Great Bridge Supercentre, Govan Livingston Supercentre (SOL), Huyton Supercentre, Pudsey Supercentre, Eastlands Supercentre, Trafford Park Supercentre, Gravesend, Milton Keynes Supercentre, Gateshead, West Bridgford, Havant Supercentre (SOL), Dagenham, Cortonwood Living, Haydon Supercentre (SOL), Eastleigh Supercentre, Eastgate Supercentre, Lower Earley, Watford Supercentre, Wigan Supercentre, Leicester Fosse Park.